Dr. Rausch was born in Calgary, Alberta, Canada. He attended Western States Chiropractic College in Portland, Oregon where he graduated with honors. 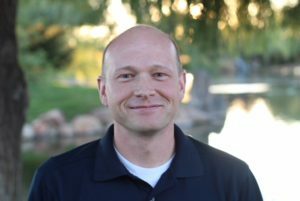 Dr. Rausch has lived in Boise since 2005 at which time he has worked at the Boise Spine Center. He is the father of five wonderful children and enjoys spending time with them. He enjoys playing golf, volleyball, basketball, and the outdoors. Because most injuries involve muscle and joint, Dr. Rausch combines exercise and massage with chiropractic adjustments in every visit. This approach allows for faster and longer lasting relief. For this reason, most treatment plans last 2-6 visits. Dr. Rausch believes that it is important for individuals to develop their knowledge of health and wellness. He knows that best results in patient care come when patients are involved in the treatment process. His treatment includes a combination of myofascial release, exercise, spinal manipulation, traction, decompression and physiotherapy modalities. Dr. Rausch works with many medical doctor due to his comprehensive, scientific and effective approach to helping patients regain function. Some of his favorite conditions to treat include pregnancy-related back pain, lumbar disc injury, sacroiliac joint pain, chronic headaches, and tendinitis.